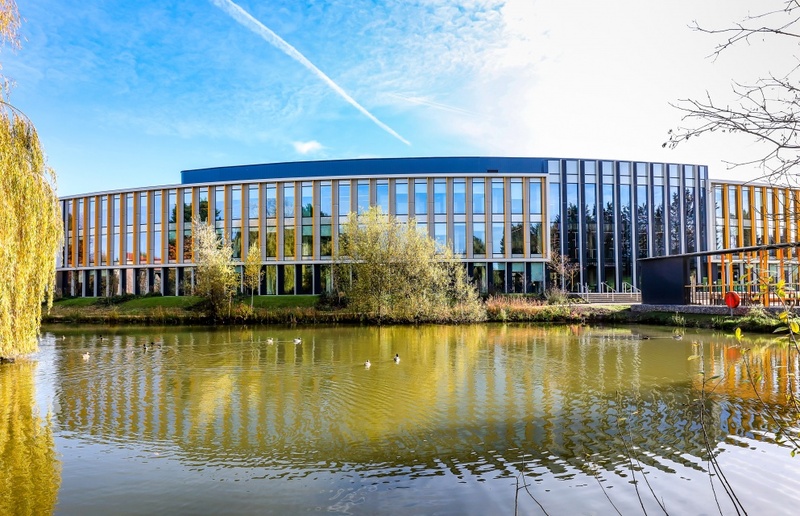 Architectural aluminium glazing systems by leading UK manufacturer Kawneer have helped a new hub building set a benchmark for the design of future developments in Europe’s first science park. 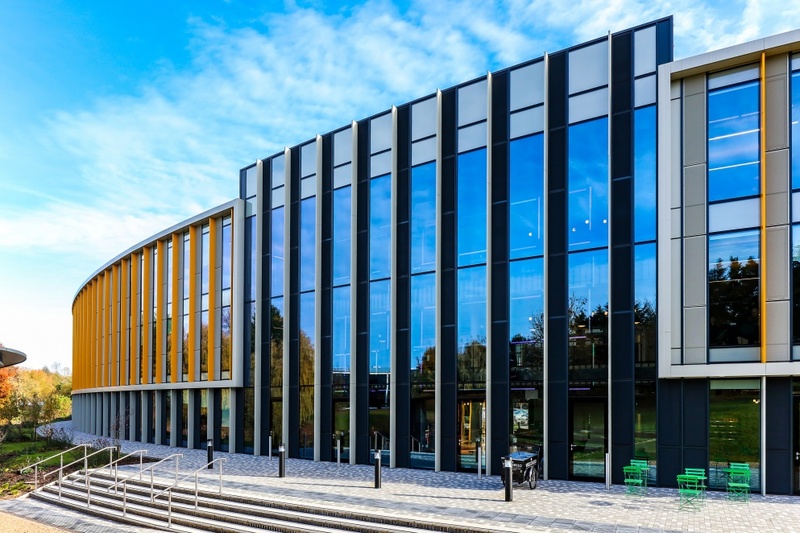 Kawneer’s AA®100 SSG (Structurally Silicone Glazed) curtain walling, with AA®720 doors and open-in side-hung vents, form the main structure to the two main facades of the £20 million John Bradfield Centre at the 151-acre Cambridge Science Park, owned by Trinity College Cambridge. Its sinuous crescent-shaped form designed to BREEAM “Excellent” by architects Aukett Swanke was inspired by its lakeside setting and uses Kawneer’s curtain walling (with 50mm sightlines and 300mm feature caps), windows and doors on the main rear facade, where visitors enter the site, and on the main facade. This atrium maximises internal connectivity. The main entrance is animated by a social hub, including café, breakout areas and meeting rooms, as well as spaces for team working, giving a dynamic open working environment that encourages collaboration and creative thinking. Upper floors are configured as open or cellular spaces to suit tenant businesses. The John Bradfield Centre plot, on land previously occupied by an older, two-storey building constructed on the park, is configured in an arc shape formed by the curve of the science park’s inner loop road and the central lake at its heart. The plot is bounded to the north and south by older, low-density, two-storey developments which will likewise be recycled in due course. The main entrance is positioned eccentrically on the inner concave facade and is approached via a generous pedestrian avenue. The primary core areas, escape stairs and risers are positioned within the inner, concave zone of the floorplate, leaving the outer zone free for flexible office configurations, all enjoying superb views over the lakeside setting. The northern and southern facades are almost completely clad. The core areas are expressed on the concave facade, while in contrast the western elevation is completely glazed to maximise natural daylight penetration and lake views. Deep projecting mullions are employed on this facade to shield the solar path. These are coloured yellow and provide a fresh uplifting quality, softened by the perimeter landscape. 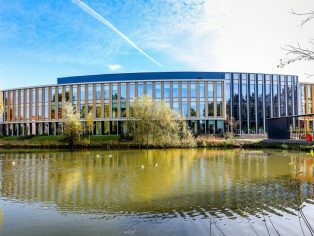 Named after the biologist, entrepreneur and former senior bursar who founded Cambridge Science Park, the John Bradfield Centre received £4.5 million of Government funding by the Department of Business, Energy and Industrial Strategy as part of its pledge to invest in the UK’s Life Science industry. Conceived as a key building at the heart of the scheme, the facility functions as a vibrant centre for research and development and offers incubator space for early-stage businesses. It has become the natural meeting point for those active in technology, innovation and entrepreneurship in Cambridge. External materials express the sinuous form of the 55,600ft2 building using simple full-height vertical aluminium cladding, complemented by the Kawneer windows that run from floor to ceiling. The result is an innovative building and integrated interior design which creates a unique workplace product in Cambridge. A truly novel working environment is created and the building is already hosting events and workshops, crystallising its intended role as a genuine magnet for the local business community. The brainchild of the client, Trinity College Cambridge, and their property advisors Bidwells, the centre is managed by workspace operators Central Working as the largest of their global network of rapidly expanding membership-based communities. Members have access to spacious communal facilities throughout the building which has capacity for more than 600 people. Non-members are welcome, and indeed encouraged, to use the café and auditorium as a 24/7 hub facility for the park. The Bradfield Centre’s facilities are designed to accelerate business to new levels. The aim is to attract smart, ambitious, like-minded entrepreneurs and companies from both Cambridge and around the world, co-locate them in scalable, state-of-the-art facilities, immerse them in a collaborative, entrepreneurial culture, and connect them to investors, partners, mentors, advisers and potential customers. Accelerator programmes are run on a wide range of business and technical topics. These will be a core component of the Bradfield Centre offer which is designed with one goal in mind – to help grow Cambridge-based businesses to a large scale.